Xaxaba Diphaphata is a flatbread or stove top muffins from Botswana. This muffins are done using minimum ingredients and can be done within 30 minutes. They can be enjoyed in Breakfast, Snack or as a side to your main Course meals. So this letter was really making me go crazy. It was really getting difficult to find a bread with X. There is no country too starting with X, so was not able to use that too. 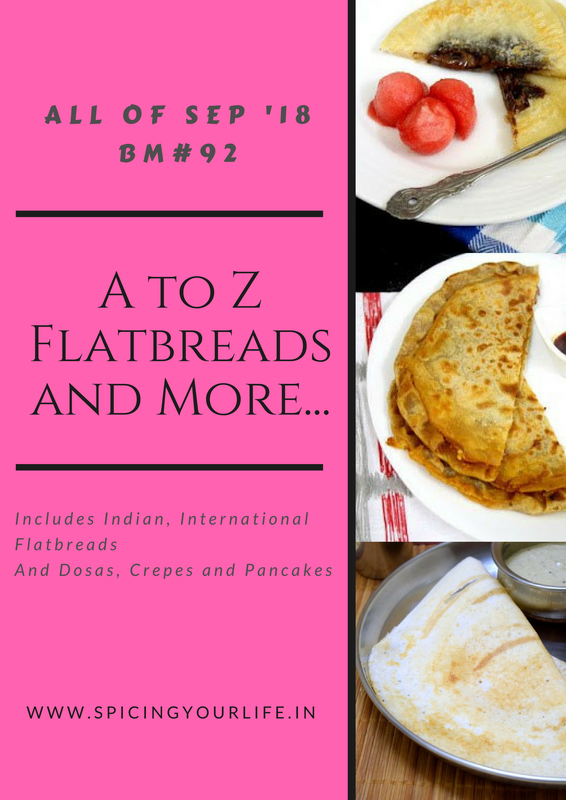 So I finally hopped on to Srivalli’s blog, who has designed this series of A-Z International flatbreads and she has already done International Flatbreads. So I simply shortlisted and followed her recipe. Reading the description on her blog, I saw that we can add vegetables like spring onion and mushrooms in this. So I modified her recipe and added some spring onions and some mashed paneer and palak mix (I was preparing another dish from this). The end result was a nice and a colorful stove top muffins or flatbread. I simply enjoyed this as is with a mix of tomato ketchup and red chilly sauce. Xaxaba Diphaphata a Flatbread or a stove top muffin from Botswana is pan fried, with minimum ingredients. In a large bowl add the flour, sugar, salt and baking powder. Mix everything. Add in the vegetables and give a quick mix. Add in the milk and make a semi soft dough. Remember that the vegetables will release some water, so do not make a very soft dough as it would be difficult to roll. Cover and let it rest for 15-30 minutes. After resting, roll it into a big circle or rectangle around 1 cm in thickness. Using a cookie cutter cut roundels . Alternatively one can divide the dough into equal size balls and roll each to 2 inch circles and 1 cm thick. Cover and shallow fry them on slow to medium using a minimum oil/butter until brown specks form on it. Serve it warm with your favorite spread. I am so excited to try this recipe. We make a lot of breads and biscuits on the cooler seasons and you get tired of the same ones over and over. This will add something new and fun to our plans! Thanks so much! They look delicious! That looks so beautiful. It would have tasted amazing with paneer and spinach…a definite must try! Love the addition of spring onions and paneer to this diphaphata Renu, thats truly very interesting. Am sure this flavourful and aromatic botwanian flatbreads will definitely please my tastebuds without any fail. Well done Renu. That looks amazing. The presentation is stunning. Love the addition of spinach and paneer to a classic bread. All those ingredients Paneer , Paalak , spring onions are making me drool over this super delicious bread . Definitely X is a hard one to crack but you have done it so beautifully ! That is a wonderful flat bread Renu. I remember Valli’s recipe. Adding herbs to make it colourful is such an amazing idea. Oh you have got it done so well Renu, the texture looks amazing..So glad you tried a different stuffing than what I had done..good pick. Lovely pick for letter X Renu, like your version of the savory Xaxaba Diphaphata. The name is quite a tongue twister. Where do you find such unique and new recipes! The brad looks great and the inside looks so fluffy and nice! my god I just love this flatbread Renu, you made it so nicely. bookmarking this bread as I am sure with spring onion it will definitely taste awesome. I am in love with this recipe. Looks so delicious and with that greens added in, this is a great way to begin the day. The texture of the bread is amazing.